The Thanksgiving hiatus brought a welcome balm to my overworked soul. 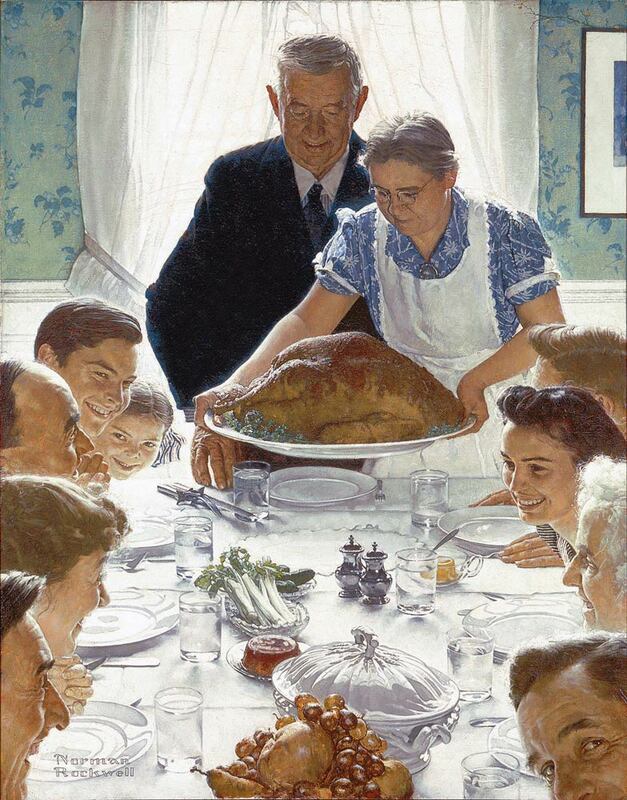 I journeyed to my boyhood home outside St. Louis, Missouri, and enjoyed a Thanksgiving meal with my parents, siblings and their children that took on the spirit of this Norman Rockwell painting posted above (I was so delighted to see that painting at a show this past summer at Fort Worth’s Amon Carter Museum). Along with the excellent food came several days of snowy weather that yielded a quantity of watercolor attempts and hours of reading pleasure from James Joyce. I plan to post more on that later. I had read Joyce’s Portrait back in the late 1980’s, and was moved by it then, but moved much more profoundly during this recent odyssey. I was of course glad that talk around our Thanksgiving table wasn’t filled with the toxic religious debate featured in the Joyce novel during their Thanksgiving.
. . . a man is rich in proportion to the number of things which he can afford to let alone. One of the more painful lessons I’ve endured in life is learning to relinquish things that bring more pain than pleasure. Of course there is always talk from the other side about high-yield risks, but one can never lose what s/he doesn’t put out on the table. So much gets put out there in life that yields no return, or worse still, yields pain that we are better off without. Freedom from want. I’m a little better tonight because of some hard lessons learned along that vein. Perhaps this is one of my better Thanksgiving seasons. Good morning from the “bedroom’ studio of Arlington, Texas. I confess that I have posted a year-old photo of what I was creating during the Thanksgiving Break last year. 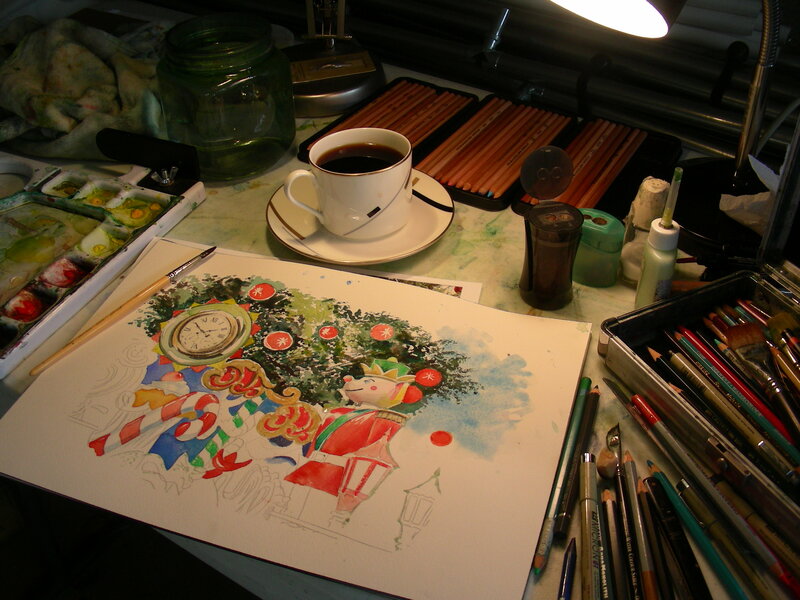 I plan to return to the “Man Cave” studio later in the day to paint. Currently, I am propped in bed with coffee, two slumbering Shih-tzu dogs, one cat and a large pile of volumes and journal. And life is pensive but serene. My breathing is slower and easier. If we only see clearly enough how mean our lives are, they will be splendid enough. Let us remember not to strive upwards too long, but sometimes drop plumb down the other way, and wallow in meanness. From the deepest pit we may see the stars, if not the sun. Let us have the presence of mind enough to sink when we can’t swim. . . . I love reading words of wisdom that address our cycles of creativity and un-creativity, our highs and lows, our energy and our inertia. When I was younger, I was frustrated by those times of famine, when I was not “on” creatively. I think I was “saved” by essays of Emerson and poems of Whitman that addressed those cycles as natural. (most notably Emerson’s “The American Scholar” and Whitman’s “As I Ebb’d with the Ocean of Life”). We inhale, we exhale. We intake, we exhaust. We inspire, we expire. Emerson wrote that it comes into us as life, it comes out of us as truth. I could describe my current moment as low, as lethargic, as uninspired, as inert. But the reality is, I am taking in sublime thoughts from Thoreau, from Emerson, from Whitman . . . and I am pushing them back out, distilled by my ever-emerging philosophy. Sitting up in bed, surrounded by an untidy house and slumbering critters, I am setting a course for today’s navigation (the Hebrew word translated “wisdom” is chochma–“the helmsman, or art of steering.” I am plotting a course with mandatory stops in Romanesque Europe (A. P. Art History for tomorrow) and Act I of Shakespeare’s Macbeth (English IV). Beyond those towns, who knows? Maybe a return to my watercolors (I think I hear the longhorns shuffling around in the garage, they must be getting restless). But whatever occurs along my way, I am anticipating another good journey today. I have put in two consecutive late nights in the garage studio, painting till past midnight. It makes it a little rough, going to school the next morning, but there it is. This is another full-size sheet of watercolor paper (22 x 28″). I have painted this abandoned store twice before. I discovered it in the summer of 2009 while driving highway 79 north of St. Louis along the Mississippi River. The small town of Winfield is where this store rests, just along the west side of highway 79. The light was so bright that August morning, the sun had just risen. I’m having some struggles with this painting (I hate it when a watercolor starts out badly!). I poured quite a few layers of pigment on the tree/foliage area at the top, wanting to get the woods very dark and deep. I’ve decided to just let the foliage be for the time being, and go ahead and work on the store facade. Tonight involved plenty of close, tedious drawing and drafting, but I’m still convinced that a strong and accurate drawing will yield a good watercolor (hope I’m right this time!). I’m not sure that the pencil work can be seen in this photograph, I always have trouble getting a good digital image under light bulbs late at night. Most of my blog shots are taken out in the driveway in the middle of the day. I guess I’m admitting that as a photographer, I fly by the seat of my pants. 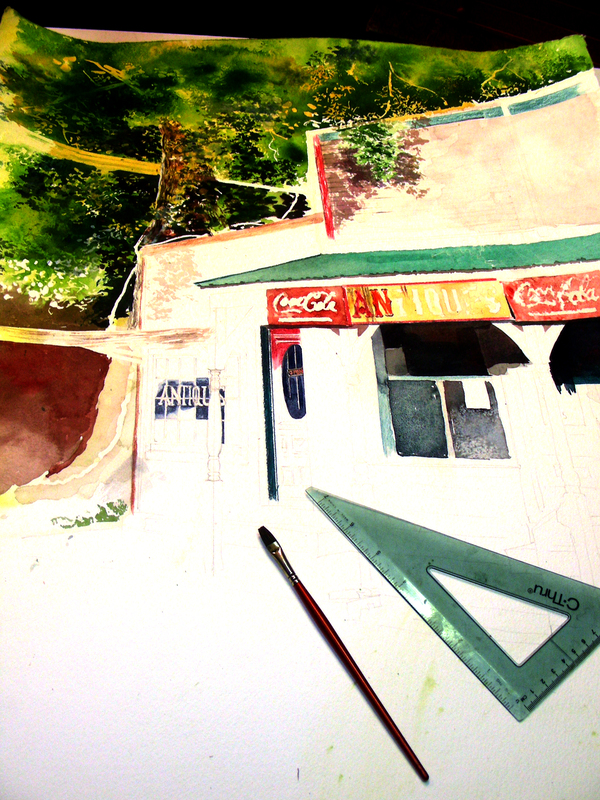 At any rate, I am finally settling into, and enjoying this watercolor composition. And with the kind of school schedule I have this week, I reckon that I’ll be having to put in late hours in the garage studio (my least favorite time to paint). I’ll take what’s offered.